How do we align the organization with the strategy? That is a question that people often raise, particularly when a new strategy has been introduced. In such cases, it may be necessary to adjust the organization to ensure that the new strategy is implemented. But how, specifically, do we do it? To clarify this issue, I interviewed executives in five large and complex firms (including 3 CEOs). They each described specific changes that had implemented as a result of new strategic priorities or initiatives. I summarize some of the key findings in the video (it lasts for 12 minutes). Why is it so difficult to align the structure with the strategy? I would like to enquire about an issue I am facing now in my drafting job descriptions and processes for the newly established Digital Banking function at my employer a Bank in Lebanon, Middle East. In fact, some internal restructuring was made and I would like to know on which grounds we can define the Digital Banking function as a division or a department. We can find under this function, audiobanking, videobanking and quality. Are these units or departments? What about units under units? What factors are taken into account in organizing this function? What is taken into account? Employees headcount, cost, profits generated, accountability, risk to give the name for units, departments, subunits or divisions? 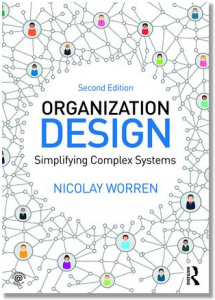 I read an article written by Lex Sisney about “Organizational Design: The Difference Between Organizational Structure and an Org Chart”, I would like to know if job titles are being eliminated and replaced by roles in companies as he seems to recommend? Hello again Natalie, I looked up Lex Sisney’s Linkedin post. From what I understand, he does not advocate removing titles; his recommendation (which I think is sound) is to not be “title centric” and start from the existing org chart when re-designing an organization. That is similar to the approach I have been advocating. In my book and my articles I describe how one may start a re-design process by formulating functions (functional requirements), which are only later translated into individual roles (and titles).